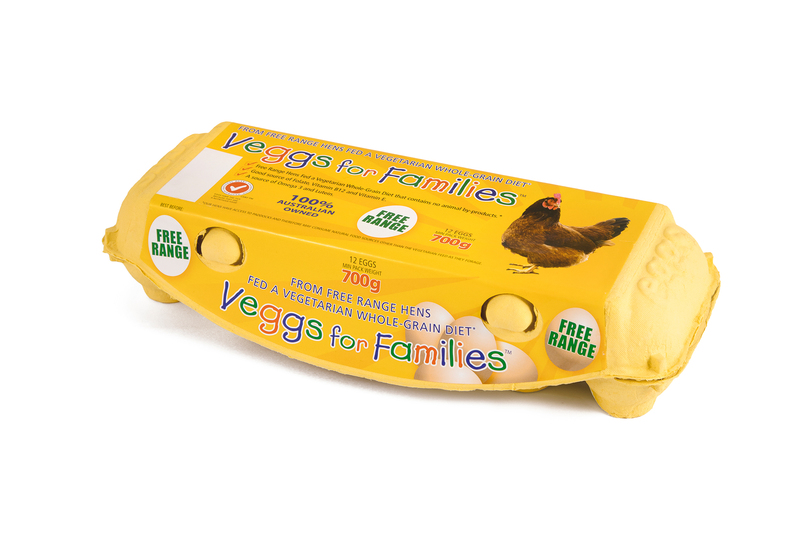 Veggs for Families™ Free Range Eggs are ideal for the whole family and will particularly appeal to the health-conscious consumer. They are laid by healthy hens fed on a specially formulated fat modified, vegetarian diet. This completely balanced diet contains only the best quality natural ingredients such as wheat, alfalfa, sunflower seeds, marigold, corn, lucerne, peas and beans. Soya bean protein replaces animal protein, and along with linseed, canola and flax seed, contributes to the presence of beneficial omega-3 fatty acids in the egg yolk. These ingredients also offer a unique, non-fish source of vital fatty acids. A breakfast containing Veggs for Families™ Free Range Eggs is a great start to the day for young and old, from toddlers to the older folk. Quite simply, Veggs for Families™ eggs taste delicious. *Our hens are free to roam our paddocks and therefore may consume natural food sources other than the vegetarian feed as they forage. No animal by-products used in our hens diet. Good source of Folate, Vitamin B12 and Vitamin E.
A good source of Lutein.